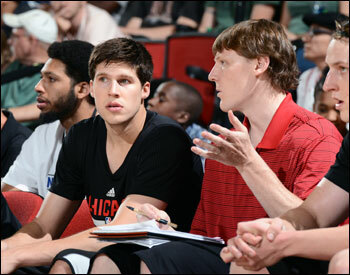 The young coach sits at the end of the Bulls bench in summer league, watching intently, offering a bit but also trying to learn. Coby Karl, the son of veteran NBA coach George Karl, is helping out as a Bulls assistant this summer. But he has much to offer beyond his knowledge of the fundamentals. As the son of a top NBA coach, Coby was a young man of privilege, being able to work with and listen to the great teachers and players his father worked with and coached. But it’s as much the unusual and valuable lessons he can bring that are so vital, especially in summer league, as what you do with your opportunities that matter most. Perhaps George could help Coby get in the door, though Coby didn’t have a college athletic scholarship and was a walk-on at Boise State. But he made the most inside; it’s what you do. There are valuable lessons in resilience and determination that can serve young people well and Coby is passing them on to the Bulls summer leaguers with his presence and advice. “As much of an advantage as that gives me, if I don’t take advantage, make the most of that opportunity, being around great coaches, being around great players and being able to watch them work, if I don’t take advantage I won’t be successful,” says Coby. “What I always say is my dad’s given me great opportunities. But it’s always the person’s choice whether they make the most of it or not. It’s great to be around the coaches and the players, but at the end of the day that’s not getting me a job; it didn’t get me a scholarship. It’s your choice what you make of the opportunity. 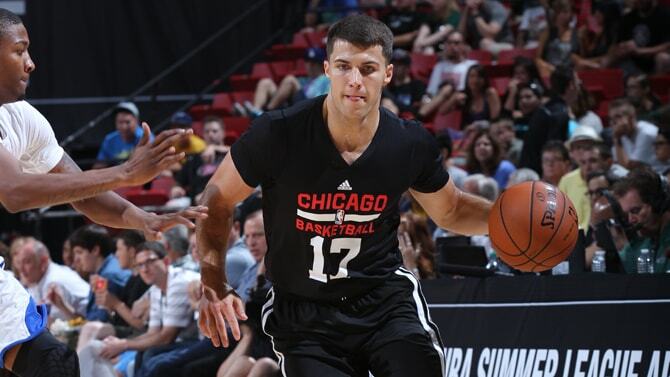 The Bulls Thursday continued to take advantage in summer league with a 79-68 victory over the Philadelphia 76ers in the NCAA style tournament to close summer league. The Bulls now are 4-0 and will face the Sacramento Kings on Saturday in the quarterfinals. Chicago was led Thursday by second round pick Cameron Bairstow with 18 points and eight rebounds and Tony Snell also with 18 points and seven rebounds. Doug McDermott had 11 points and five rebounds on three of 10 shooting, but also two blocks. Snell had three blocks. Bairstow was 11 of 13 on free throws. As for Coby, he is not joining the Bulls coaching staff this season. The summer is a favor from Bulls coach Tom Thibodeau, who has known Coby through Coby’s cameos in the NBA and playing in the D-League and Europe. Coby will return to Germany to play for Riesen Ludwigsburg after Bulls summer league and, he says, play in Europe perhaps a few more seasons. Though his goal is to coach professionally. And he’s building an intriguing resume as not only as a player and student, but someone who can be a model of perseverance against the odds. “I’m pretty proud,” says Coby, a slightly built 6-5 guard and small forward. “I started as a walk-on at Boise State. Undrafted, I played for the Lakers one year, almost won a championship (splitting the 2007-08 season between the D-League and Lakers). I made a couple of other teams and I actually ended up being a part of an NBA game with Warriors, playing 20-plus minutes (Coby played a total of 184 NBA minutes over two seasons with the Lakers, Cavaliers and Warriors). It’s a valuable lesson in resilience and determination that can serve young people well and Coby is passing it on to the Bulls summer leaguers with his presence and advice. Not so much for players like McDermott and Snell, who’ll be with the Bulls this season. But the majority of summer league players will be seeking jobs in the minor leagues or overseas. Coby Karl’s history shows you can make a career if you don’t quit on yourself. Coby had the child’s life of an itinerant coach like his father. He was born in Great Falls, Mont., where George was coaching in the CBA. “It’s why the NBA is home for me,” Coby says. “The gym is home. That was the constant, being around teams. Great Falls, then Cleveland, Golden State and in between him getting fired and moving back to Boise where my mom is from. Golden State to Albany to Spain, back to Albany, back to Spain. Then Seattle, where I had a lot more stability being somewhere more that two years. Then Milwaukee, where I went to high school and made my closest friends. There and Boise State were the best places for me. Though a walk on at Boise State, Coby emerged as one of the top players. He got a chance on the Lakers summer league team in 2007. His poise, leadership, confidence and basketball intellect impressed Phil Jackson, and Coby made the Lakers 15-player roster. He spent most of the season with the Lakers D-League team, but did get into a playoff game in the series with the Nuggets as he became the first NBA player ever to play against his father as a coach. Coby went overseas the next season, but gave the NBA another try in 2009 and made the Cavs roster in LeBron James’ last first run in Cleveland. It wasn’t much time in the NBA, but it was with Kobe and LeBron. Coby was released in January, caught on and played a bit with the Warriors, was released again and was picked up by George with the Nuggets, though Coby did not play. He’s since played in Spain, Italy, the D-League and Germany, where he returns for this season. The Bulls’ kids now have the opportunity. They are fortunate to have around someone like Coby Karl, who is a living example of not wasting any opportunity.